Either it's something in the air, or maybe its just about time again .. but somehow people just seem to know! The next version of NCrunch is ready to spread its continuous testing love throughout the world. Performance and stability were major goals for the 1.39b release. Feature requests and compatibility fixes also took a big role in shaping the contents of 1.39b, so I have many people to thank for sharing their thoughts and experiences in the support forum. So anyway, let's take a look and see what 1.39b has to offer! By popular demand, NCrunch now has a specialised view dedicated to showing metrics across your open solution - with a specific focus on code coverage! You can easily access this view at any time through the NCrunch menu. When you do so, you'll be presented with a tidy dockable pane allowing you to drill down into various metrics across your solution. In the likely event that your solution contains some code you're not interested in viewing metrics for, you can easily exclude these metrics from the totals ("grey them out") by selecting the project, directory or source file, then using the leftmost toolbar option or the 'Exclude from metrics aggregation' context menu option. An export option is available in case you want to keep track of your metrics over time through your own system. You can also navigate to your source code by double-clicking any of the source files listed here, so there's no excuse for not tracking down those low percentages! You won't find a refresh button on the Metrics View. It updates in real time as you make changes to your source code. It's been a long time coming, and now those useful little hyperlinks are finally here. 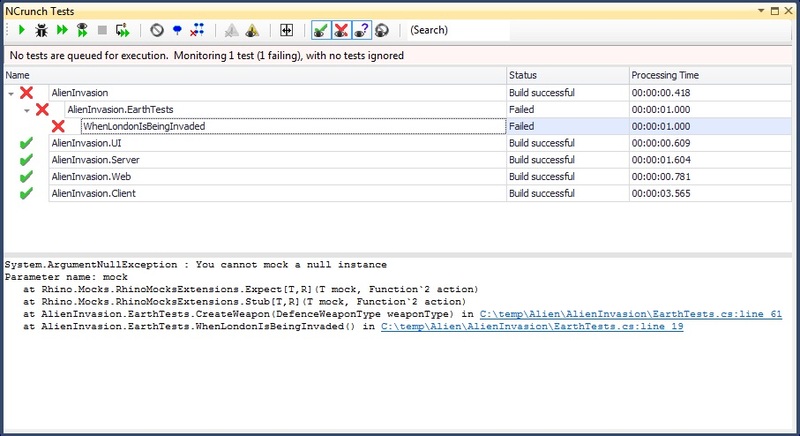 You can now navigate from build errors and runtime exceptions directly into your source code. A new range of colour options has been added to the global configuration for the corner spinner. You can now change all colours of the spinner, from the circles right down to the text inside. Of particular interest here is the ability to change the colour of the orbiting points on the spinner. Because these orbiters actually represent tasks being executed by the NCrunch engine, you can choose different colours for different types of tasks. 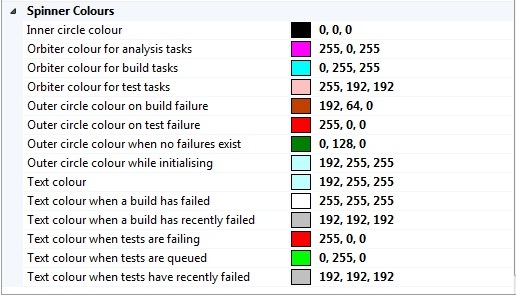 Nothing quite like watching bright blue test tasks chasing bright yellow build tasks around in a circle. Perhaps I should include a hypnosis option for the next release? NCrunch 1.39b adds support for the new version of NUnit released back in February. This means you can now use NUnit action attributes. This release includes a partial rewrite of the code coverage mapping routine at the core of NCrunch in a bid to improve performance on large and heavily tested solutions, along with many other performance improvements. After giving this a good thrash on some heavy solutions, I can confidently say that this is so far the fastest version of NCrunch by a great many miles. Beyond all of the above, this release also contains 27 other fixes and compatibility improvements to make the NCrunch experience more fullfilling and more accessible to all. Anyway, go grab the new version and get crunching!